The UK Guitar Show will take place this coming weekend at at London’s Olympia. The two-day event will be packed with things to see and do in what promises to be the ultimate celebration of the guitar. Here, we’ve listed seven reasons why you can’t miss this amazing weekend. So grab your tickets, and get ready for an unforgettable experience. The weekend will see a range of live performances from guitarists from across musical genres, including Alice Cooper’s guitarist Nita Strauss, Periphery’s Misha Mansoor, folk legend Martin Simpson and blues-rock sensation Simon McBride. Two more yet-to-be-announced artists will also take to the Main Stage over the two days. 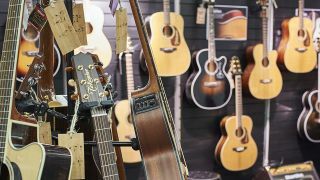 Get ready to drool over equipment from the biggest names in the business, including Faith, Peavey, Shergold, Auden, Blackstar, Fender, Ovation, Gretsch, Takamine, Jackson, Vox, Marshall, PRS, Ernie Ball, Music Man, Yamaha, Line 6 and much more. You’ll be able to attend workshops, clinics and sessions on a huge range of topics – from rock’n’roll for beginners, to using harmony, scales and chords to create more interesting melodies. All the sessions will be run by experts including YouTube sensation Justin Sandercoe. Get up close and personal with 21 of Rory Gallagher's iconic guitars, including his legendary '61 Strat. Marshall, Vox and Orange will also exhibit landmark amps from the last 60 years, plus expect gear and performances from Seven Decades. The Guitarist Of The Year competitions with PRS and Takamine will shine a light on the world’s greatest amateur guitarists. Watch the finalists show off their skills to a panel of star judges live on stage at the UK Guitar Show. Don't miss a never-to-be-repeated set of Cream and Jimi Hendrix classics from The Cream Experience on Saturday evening, or the Telecaster, Les Paul and Strat focused sessions played on some of the world’s rarest guitars by the Seven Decades band. What could be better than hanging around with other guitarists and being surrounded by nothing but guitars all weekend? The gear hall and performance and workshop schedules are jam packed, offering a whole lot of fun for guitarists young and old and of all ages and abilities. Don’t miss out on this celebration of all things guitar – get your tickets now.